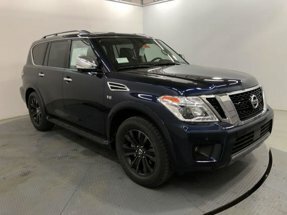 Description Moonroof, Heated Leather Seats, Entertainment System, Nav System, Third Row Seat, [X01] CAPTAIN'S CHAIRS PACKAGE, Hitch, Aluminum Wheels, All Wheel Drive, Quad Bucket Seats. SUPER BLACK exterior and Black/Brown interior, Platinum trim. Warranty 5 yrs/60k Miles - Drivetrain Warranty; CLICK NOW! CAPTAIN'S CHAIRS PACKAGE Seating revised from 8 to 7 passengers, 2nd Row Center Console w/ Padded Armrest, 2nd Row Captain's Chairs. Nissan Platinum with SUPER BLACK exterior and Black/Brown interior features a 8 Cylinder Engine with 390 HP at 5800 RPM*.